Box Dimensions (LxWxH) 13.5 x 8.7 x 3.8"
110G Locking Caster Set is rated 4.8 out of 5 by 12. Rated 5 out of 5 by Theodore W. from Solid, heavy duty casters Bought two sets for my Manfrotto boom stands. Casters are heavy, but solid. Manfrotto stands have a pre-drilled hole for the caster plastic tabs which have a slightly raised bump that fits in the hole to prevent the casters from twisting on the 22 mm tubing. The casters are attached with M6-1.00 metric screws with a flat-head. I replaced these with some hex screws for quicker installation & removal on location. Thumb screws would probably protrude too far and interfere with caster rotation. 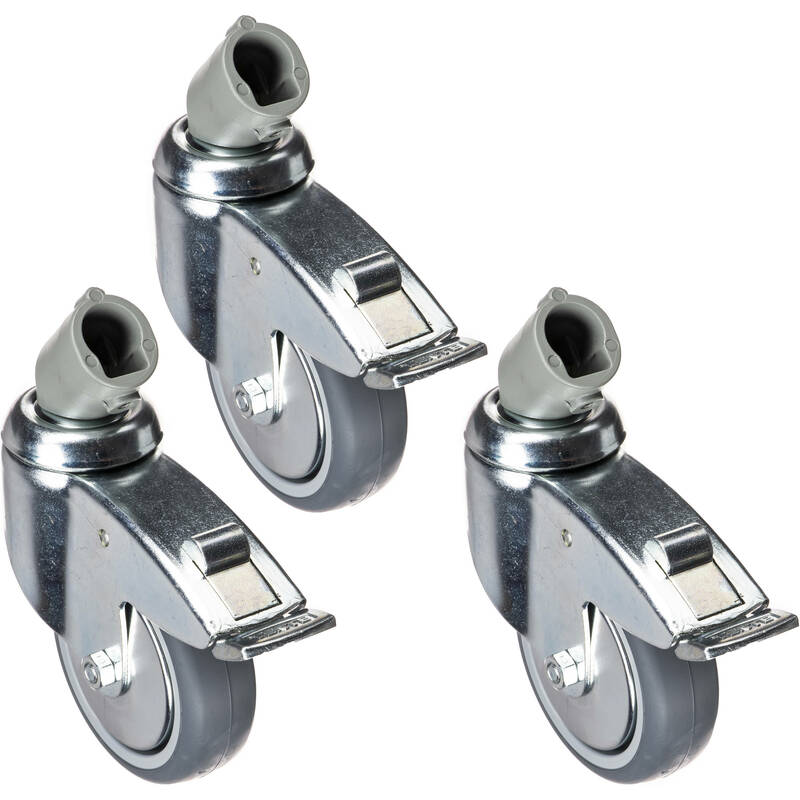 The 100mm (3.93) caster wheels make moving stands much easier, although they add significant height to your stands. The locking feature is nice too. Overall, great product. Rated 4 out of 5 by Ross from Wheel lock require a lot of strength I bought these for use on a boom stand and they really make moving the stand a breeze. As with all wheel locks I've experienced, these require engaging and disengaging by hand as the wheels scoot aways when I try to use my foot. I've resorted to engaging and disengaging by hand. These particular wheel locks are very strong/stiff and require a lot of strength in your hands. Rated 5 out of 5 by Jason from Great set of wheels I got these casters to use with the Manfrotto combi boom stand. They are a very heavy duty and roll smoothly. The locking mechanisms are very stiff, but work great. Only a few bucks more than the smaller (75mm) version so I went for these expecting them to roll better on less-than-perfect surfaces (rugs, etc.). Attach fairly easily to compatible stands with an allen wrench (not included). Only negatives... they are fairly heavy and would have to be removed to completely collapse the legs of the stand. Exactly what I expected though. Rated 5 out of 5 by Wigdaddymax from An Important Detail I've purchased wheels for all my heavy duty light stands. I find it to be the safest way move top heavy studio equipment. The wheels allow for fine adjustments to the location of lights without having to lift the base of the stand off the ground. The end result is the stands are less prone to toppling over. When choosing caster sets I always try to purchase the largest wheel diameter available. The larger the wheel diameter, the easier it is to roll over cables and imperfections in the floor. I also strongly recommend locking wheels to be sure the equipment stays exactly as you left it. In short, the investment in castors can help prevent accidents which can otherwise be quite costly when it comes to replacing expensive flashes and/or continuous lighting. Rated 4 out of 5 by Anonymous from Makes life easier, wobblier. Got this for a wedding on the Queen Mary, and it made life for me and my assistant much easier. Only problem is if the legs aren't extended perfectly, you throw the wheels out of alignment and you end up with some pretty good wobble as you push your stand down the walk. Rated 5 out of 5 by Gerald from Perfect! I use these casters on the Manfrotto 1005BAC stands and they are perfect! There's a small hole in the base of the stand legs that takes a metal insert fitting piece and then the caster is screwed in against that piece, so the stand is perfectly configured to accept these castors. Excellent fit. Super heavy duty with a large rubber treaded caster wheel that should have no issue rolling on any surface. And the brake feature is a must. Try making a significant light box change with 3 unbraked wheels and the stand rolling around; so you want it braked. I disagree with another reviewer about the strength required to engage and disengage the brakes. Yes, they are a very firm action, but I didn't find them difficult to use. They are more expensive than some other options, but absolutely worth it. Rated 5 out of 5 by Tim from Very Nice! These are nice! I lucked into being gifted a Manfrotto superboom but it had no casters. I read the reviews here on B&H and went with these big boys. I'll tell you - Manfrotto thinks of everything. There is only one way they go onto the legs so their position is perfect. Operation is absolutely smooth. Rated 5 out of 5 by Anonymous from Great addition What I should have purchased along with the cine stand. I'm glad I went with the larger of the two sets, it makes rolling from different surfaces with a boom, light, and box effortless. Perfect. will this caster fit the avenger light stand? What is the difference between this model and the very similar named 110 model (without the &quot;G&quot; after the 110)? The 110 Casters has a slightly shorter foot brake versus the longer foot brake on the 110G. Both fit 22mm legs. Will these casters fit on Manfrotto 032BASE Single Base for Autopole? Yes, the leg of the Manfrotto 032BASE Single Base is round and 22mm in diameter. Check the Specifications tab for both products. Will it also fit for the Manfrotto 420B and the Manfrotto 420CSU nightstand? It should fit if the tubing is 22mm and round. I've checked both the 420B and 420CSU, they both have 22mm tubing. Besides, 110 casters were under the 420B recommended accessories list.Bare in mind that the 110G has bigger wheels (100mm) than the 110 wheels (75mm). Both have brakes, but it all depends on how you use it and on what stand.Hope this helps. Will this caster fit on a Manfrotto 1004BAC light stand? Asked by: Yi Fan C.